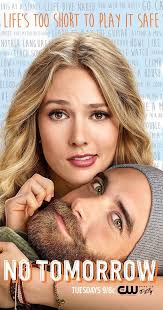 No Tomorrow (CW) Rated TV-14 | What to Watch. Evie, a quality control assessor, falls for Xavier, a thrill seeker, only to learn he lives that way because he believes the world is ending. Starring Joshua Sasse, Tori Anderson, Jonathan Langdon, Sarayu Blue, Jesse Rath, Amy Pietz, Ted McGinley, Kelly Stables, Elizabeth Bowen. I’m on the fence about this show. I couldn’t tell if it was trying to be serious or comical. If nothing serious is intended, then it seems completely senseless to me. Granted, Sasse is easy on the eyes, but I don’t see the connection between his character (Xavier) and Anderson’s (Evie). I can tell she is in love with him, but he never even looks at her with any kind of affection. I’m wondering if he has an ulterior motive. Even that theory isn’t enough to keep me watching, though. This show is a pass. This entry was posted in 2016, CW, Drama, Rated TV-14, reviews, Tv shows and tagged Amy Pietz, comical, cw, Elizabeth Bowen, in love, Jesse Rath, Jonathan Langdon, Joshua Sasse, Kelly Stables, lives, love, No Tomorrow, not worth, quality control assessor, Sarayu Blue, serious, show, Ted McGinley, thrill seeker, Tori Anderson, trailer, TV series, Tv shows, ulterior motive, world. Bookmark the permalink. Pingback: People’s Choice Award Nominees 2017 | What to Watch. Pingback: New Fall Tv Shows 2016 | What to Watch.